Measurement Tape:- Carbon Steel Blade :: Plastic Made ABS Body ::Dura Coat Tape Blade 4X Longer Life ::EEC Pattern Approval Class II Accuracy. Measurement Tape Material: Carbon Steel, ABS. Allen Keys are made from special grade Alloy steel which withstands higher Torque as compared to Allen Keys made from CrV Steel. 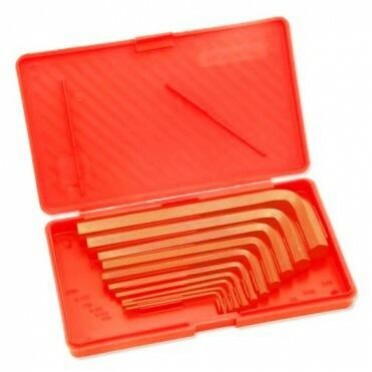 The Allen Keys are Precision Drawn for perfect matching of Allen keys with the screw head. Allen Keys are specially coated and oiled for rust prevention, also are aesthetically good looking. TAPARIA Allen Keys generally Conform to I.S. 3082-2008. Features :Forged with high grade steel, and heat treated to give long trouble free service.Left hand.. Description :Drop forged from high carbon steel and scientifically heat - treated to give tough body.. Description :Taparia Screwdriver set 6pcs 821The blades are made from high grade Silico-Manganese st.. Features & Specifications :Made from high grade carbon steel, with high grade malleable cast iro.. Features :Generally Conforming to IS 2028-2004It is made from high grade steel,forged and accurately..
No of pcs : 10 nos, Black finishContains : 10 Pcs. Set (1/16", 5/64", 3/32" 1/8", .132", 3/16", 7/.. Features :Consists of a TAPARIA Line Tester and an easily attachable extension cord with a Tes.. Features :Taparia Tools started manufacturing hand tools in 1969 in India in technical collaboration..